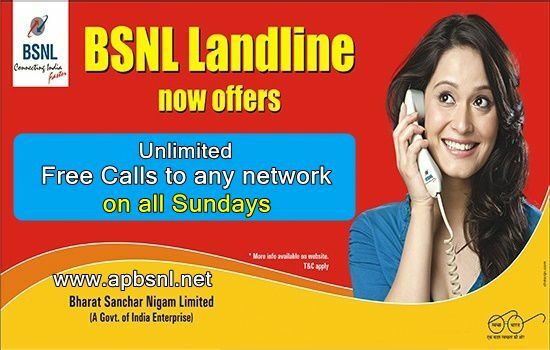 Wow… BSNL again comeup with another attractive promotional offer offering Unlimited free calling to any network on Sundays for Landline customers. State run Telecom Company Bharat Sanchar Nigam Limited (BSNL) under Freedom Offer i.e Independence Day announced Unlimited Free calls to both BSNL and Other network numbers on Sundays from BSNL Landline phones from 15th August, 2016 onwards. BSNL already introduced promotional offers for Independence and Rakshabandhan under Mobile Services offering Extra free data usage, validity extension for existing bsnl data pack, Full talk value on 70 topup voucher and one month monthly rent waiver for prepaid to postpaid migration for bsnl mobile users. As per latest information, BSNL competent authority has decided to offer ‘Unlimited Free calling to any network on Sundays from BSNL Landline connection phones in all Telecom circles under BSNL Freedom Offer. BSNL already offering Free Night calling facility for Landline users with Unlimited calling to any network from 09:00pm to 07:00am from BSNL Landline services. In addition to that BSNL customer can enjoy the extra benefit of Unlimited calls on Sundays without any extra rental or additional or hidden charges. The above scheme will be implemented with effect from 15th August, 2016 onwards in all Telecom Circles till further orders released.